Yamaha Motor: ASEAN Sports Brand Strategy, Indonesia to Manufacture and Sell YZF-R15 - News Releases | Yamaha Motor Co., Ltd.
IWATA, April 16, 2014 - Yamaha Motor Co., Ltd. (Tokyo: 7272) announced today that Indonesia will follow in the footsteps of India to commence manufacture of the 150cc supersport model, YZF-R15, for launch on the Indonesian market from May this year. 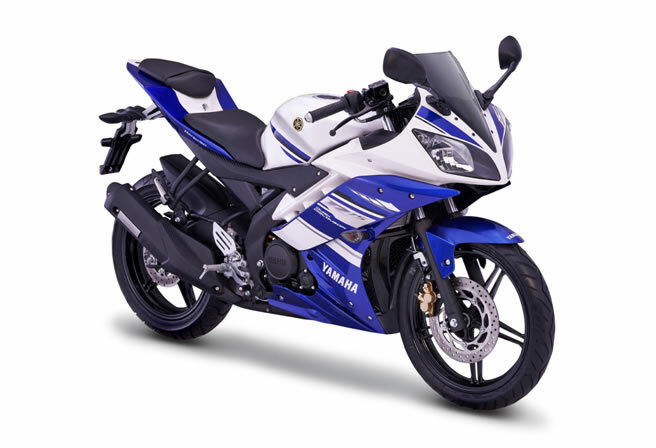 The YZF-R15 is a full-scale supersport model that inherits its body design directly from the YZF-R series, and exhibits the sporty ride and easy urban handling characteristic of the 150cc class. Produced and sold in India since 2008, group company YIMM (PT. Yamaha Indonesia Motor Manufacturing) will now also manufacture and sell this model in Indonesia. In recent years, there have been signs of a shift in demand in the Indonesian two-wheeler market from scooters used as a means of transport to sports models for leisure. Sports models are highly sought after by the young male demographic in particular, and the V-IXION, sold since 2007, has become a popular model, achieving the biggest share of the Indonesian sports category. Additionally, in 2009, YIMM became the official sponsor of the MotoGP Yamaha Factory team, and have been implementing a brand strategy that emphasizes "racing" and "sporty image" through development of marketing initiatives that leverage their racing involvement, and the introduction of supersport flagship models YZF-R1 and YZF-R6 in November last year. Yamaha Motor expect a similar type of market to take shape throughout the entire ASEAN region in the future, and with Indonesia as the starting point, will build this brand and increase sales through progressive strengthening of the YZF-R series line up.